Familiar Microsoft programs have changed to better suit your needs. 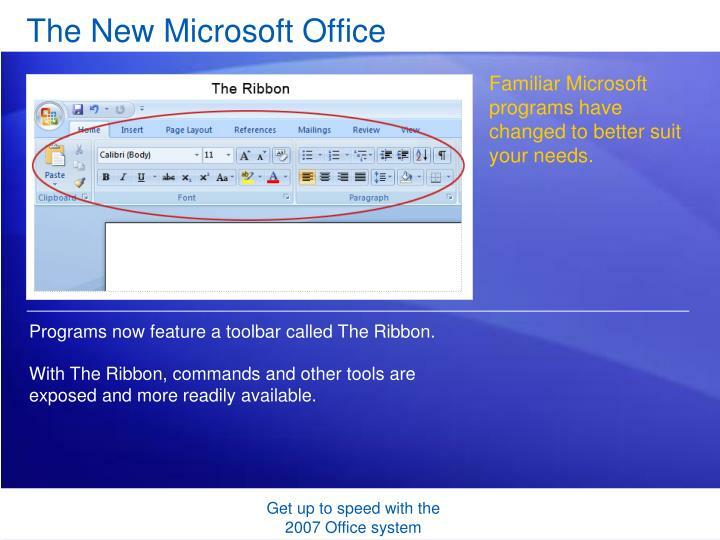 Programs now feature a toolbar called The Ribbon. 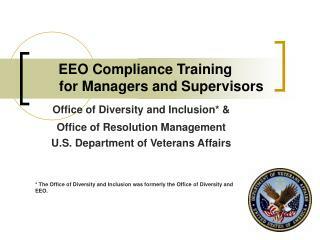 With The Ribbon, commands and other tools are exposed and more readily available. 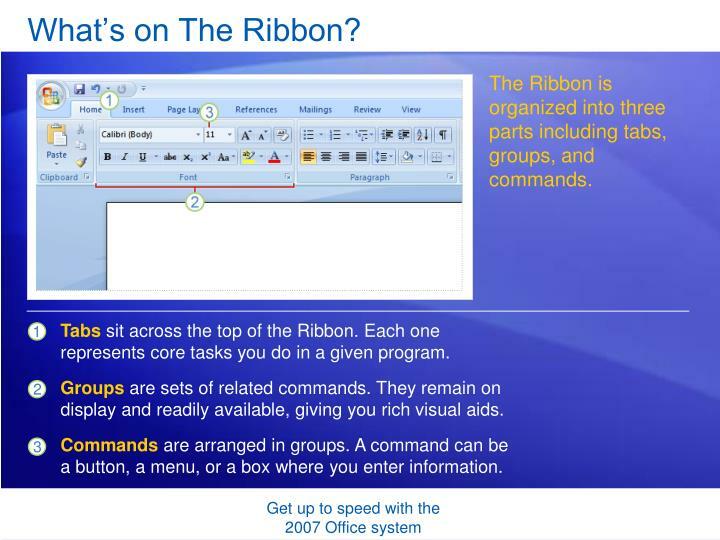 The Ribbon is organized into three parts including tabs, groups, and commands. Tabssit across the top of the Ribbon. Each one represents core tasks you do in a given program. Groupsare sets of related commands. They remain on display and readily available, giving you rich visual aids. Commandsare arranged in groups. A command can be a button, a menu, or a box where you enter information. Using the tabs is fairly simple. 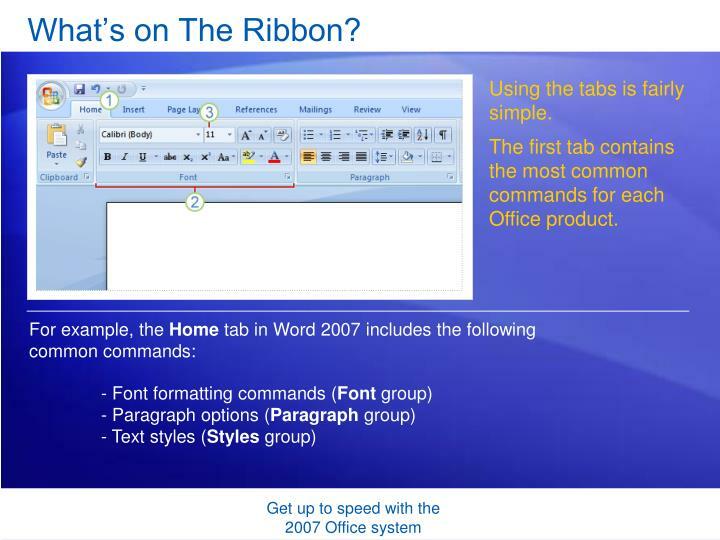 The first tab contains the most common commands for each Office product. 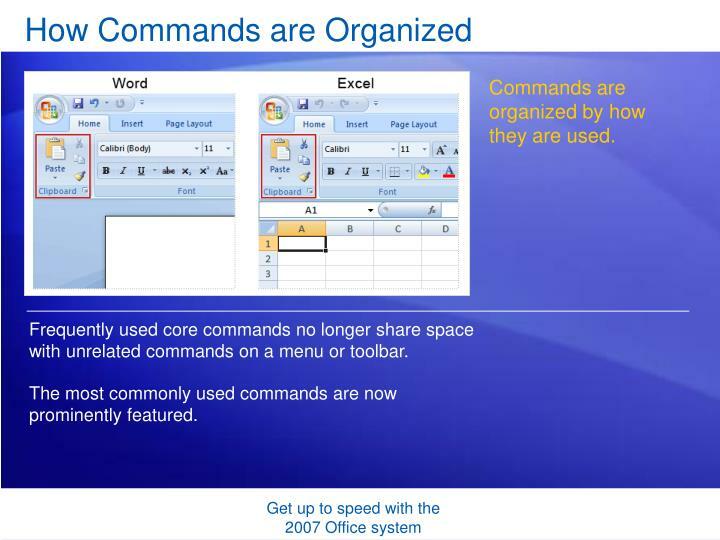 Commands are organized by how they are used. Frequently used core commands no longer share space with unrelated commands on a menu or toolbar. The most commonly used commands are now prominently featured. 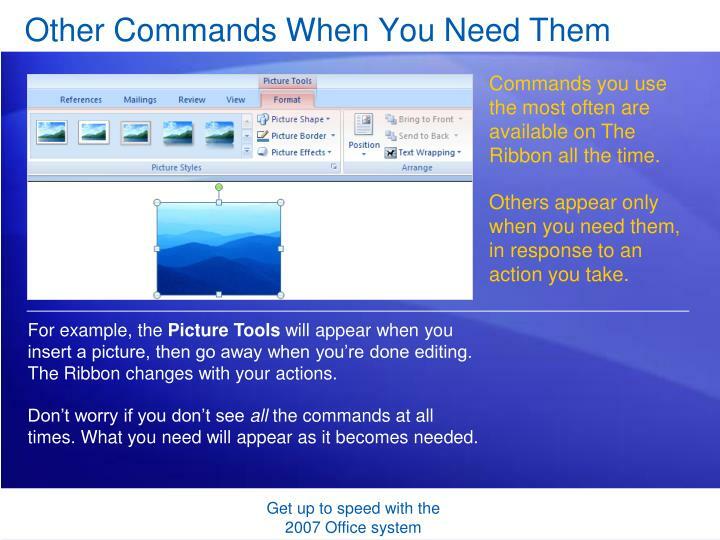 Commands you use the most often are available on The Ribbon all the time. Others appear only when you need them, in response to an action you take. For example, the Picture Tools will appear when you insert a picture, then go away when you’re done editing. 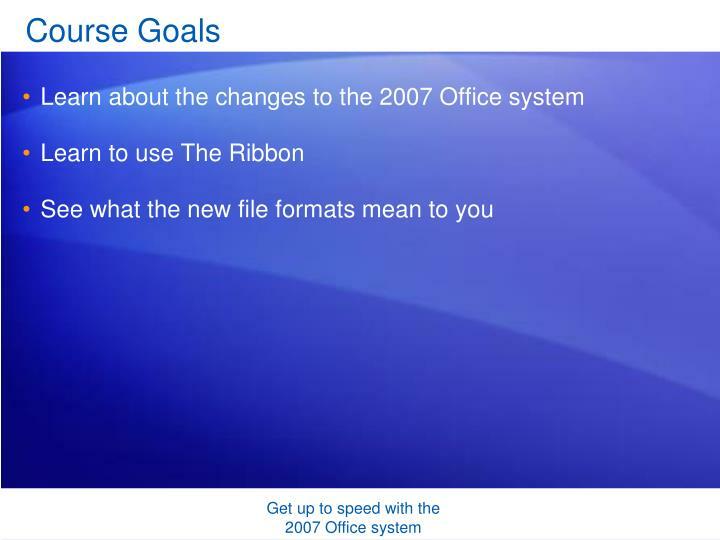 The Ribbon changes with your actions. Don’t worry if you don’t see all the commands at all times. What you need will appear as it becomes needed. 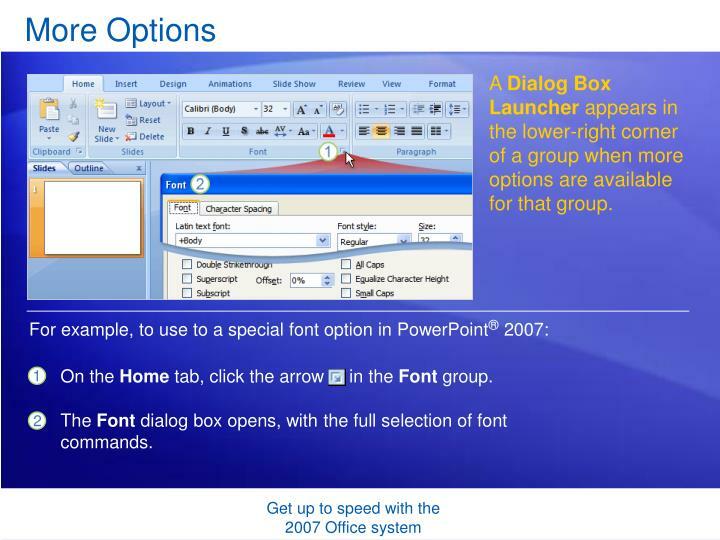 A Dialog Box Launcher appears in the lower-right corner of a group when more options are available for that group. On the Home tab, click the arrow in the Font group. The Font dialog box opens, with the full selection of font commands. Are you familiar with the try-undo-try cycle? Now you can see a live preview of your choice before you make a selection, which saves time and produces better results. Use the Quick Access Toolbar to display your most commonly used commands. Located above The Ribbon, the Quick Access Toolbar puts your favorite commands where they are readily available. 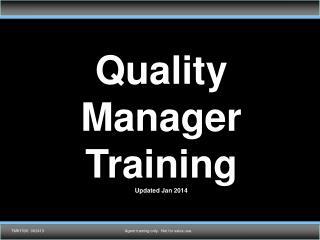 Everything described so far applies if your screen is set to high resolution and the program window is maximized. If your screen is set to a low resolution, a few groups on The Ribbon will display the group name only, not the commands in the group. Click the arrow on the group button to display the commands. 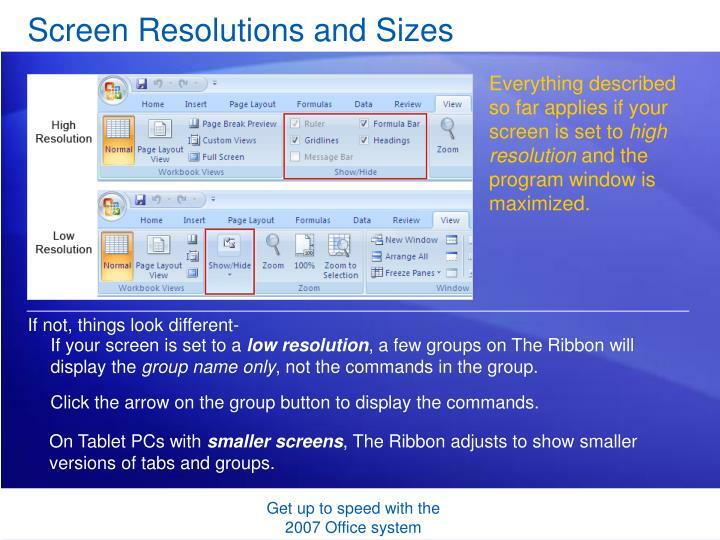 On Tablet PCs with smaller screens, The Ribbon adjusts to show smaller versions of tabs and groups. Now it’s time to look beyond The Ribbon to see what else is new. 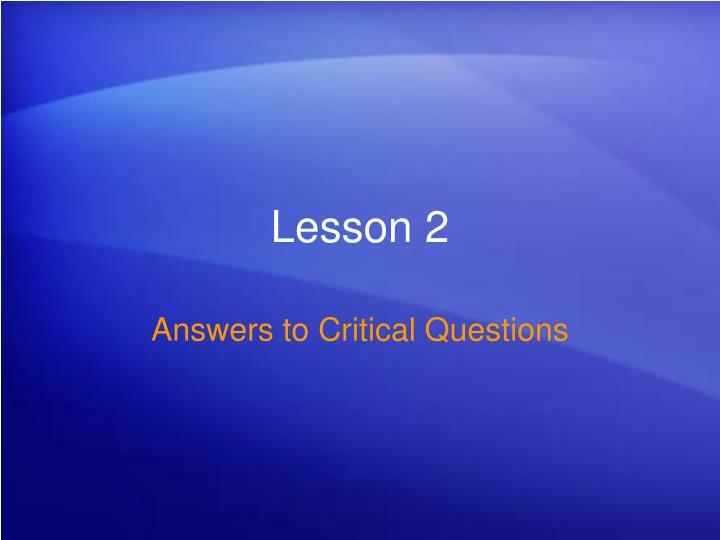 In this lesson, you’ll find out how to work with some of the new options. 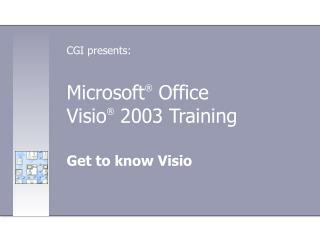 The Microsoft Office Button appears in the upper-left corner of the window. The button features more commands than the former File menu offered. 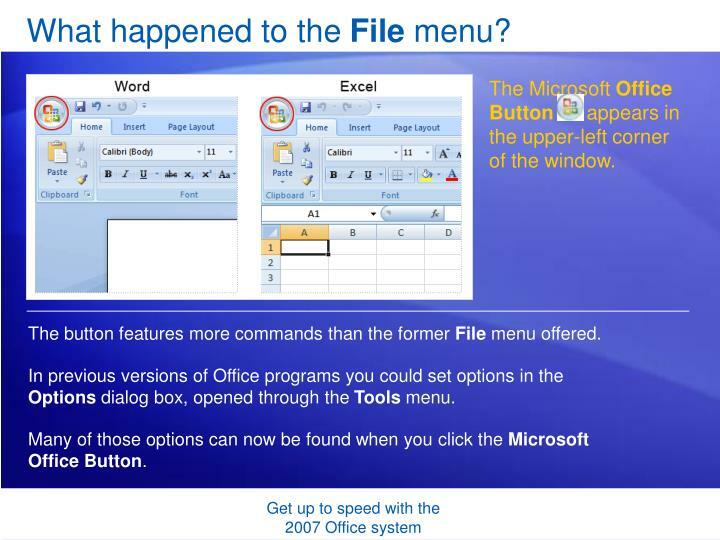 In previous versions of Office programs you could set options in the Options dialog box, opened through the Tools menu. 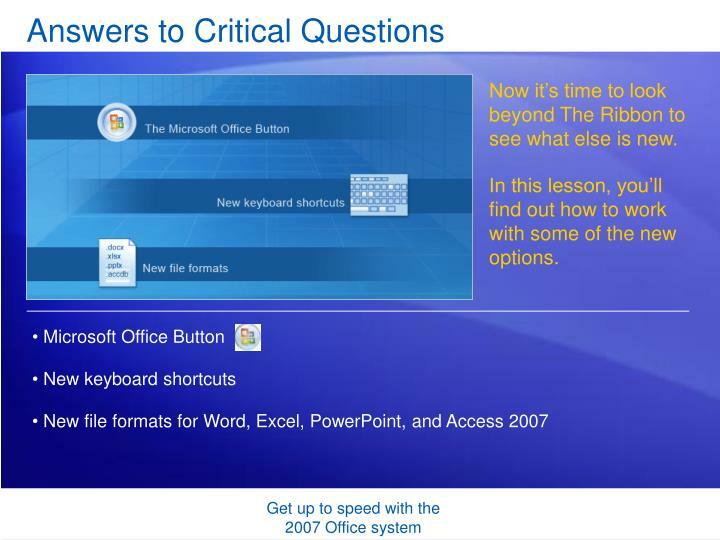 Many of those options can now be found when you click the Microsoft Office Button. 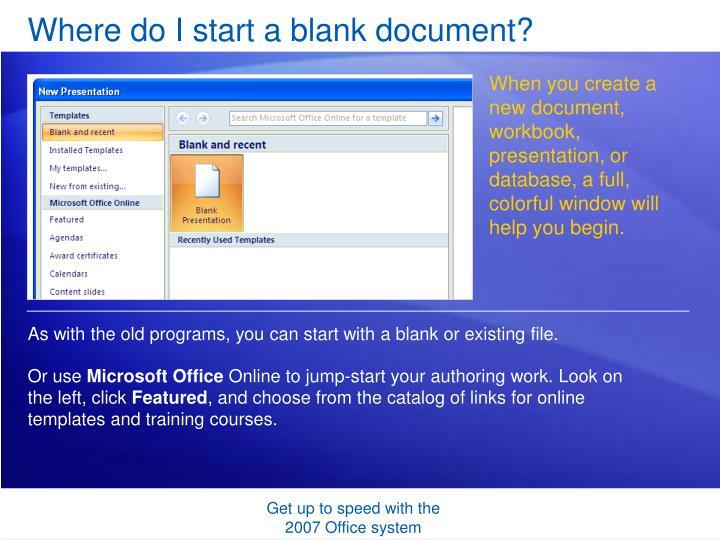 Where do I start a blank document? 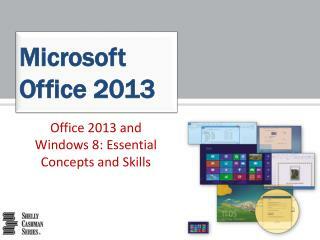 When you create a new document, workbook, presentation, or database, a full, colorful window will help you begin. As with the old programs, you can start with a blank or existing file. 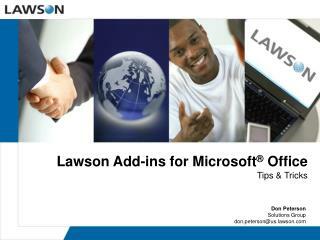 Or use Microsoft Office Online to jump-start your authoring work. 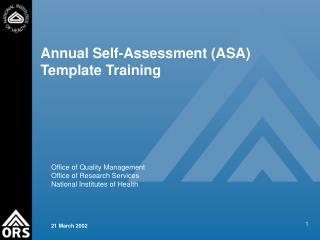 Look on the left, click Featured, and choose from the catalog of links for online templates and training courses. What about favorite keyboard shortcuts? 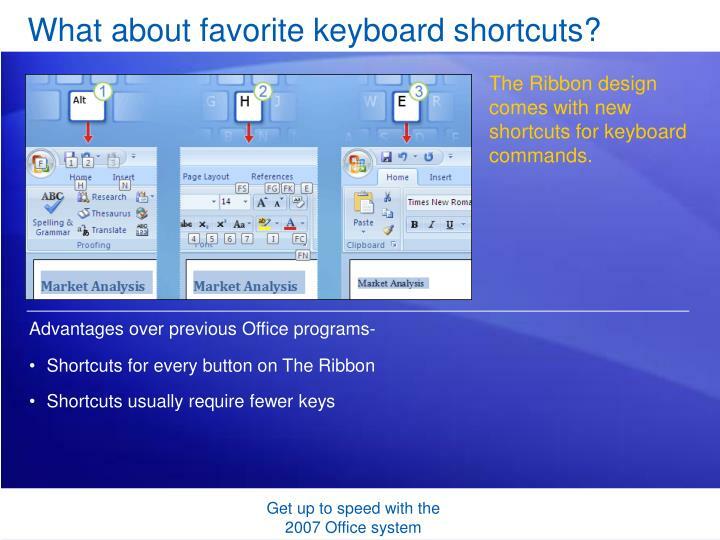 The Ribbon design comes with new shortcuts for keyboard commands. The picture shows an example of using Key Tips to remove a heading style in Word. Press ALT to make the Key Tips appear. Press H to select the Home tab. Press E to select the Clear Formatting button in the Font group to remove the heading style. Keyboard shortcuts of old that begin with CTRL are still intact, and you can use them as you always have. 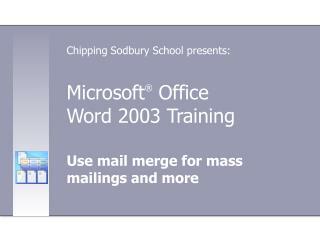 For instance, the shortcut CTRL+C still copies items from the document to the clipboard. 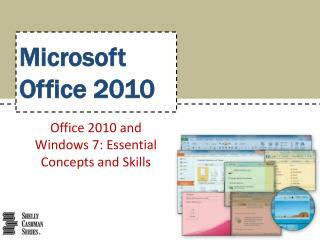 The shortcut CTRL+V still pastes items from the clipboard to the document. 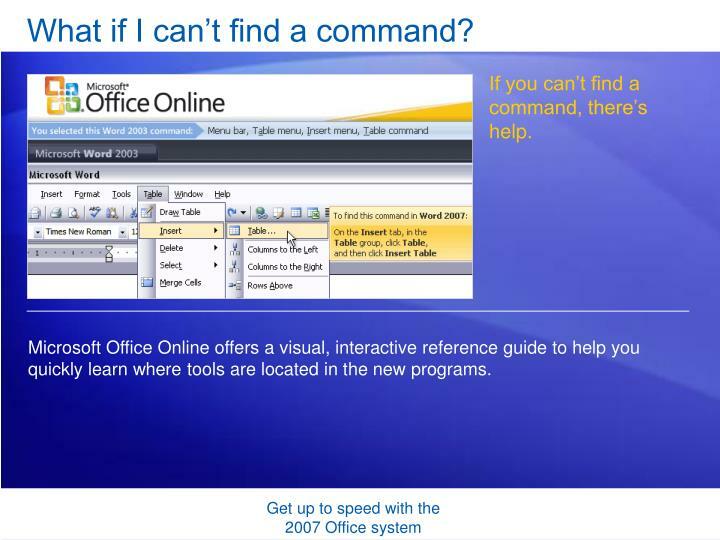 What if I can’t find a command? If you can’t find a command, there’s help. 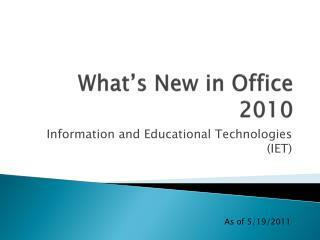 Microsoft Office Online offers a visual, interactive reference guide to help you quickly learn where tools are located in the new programs. 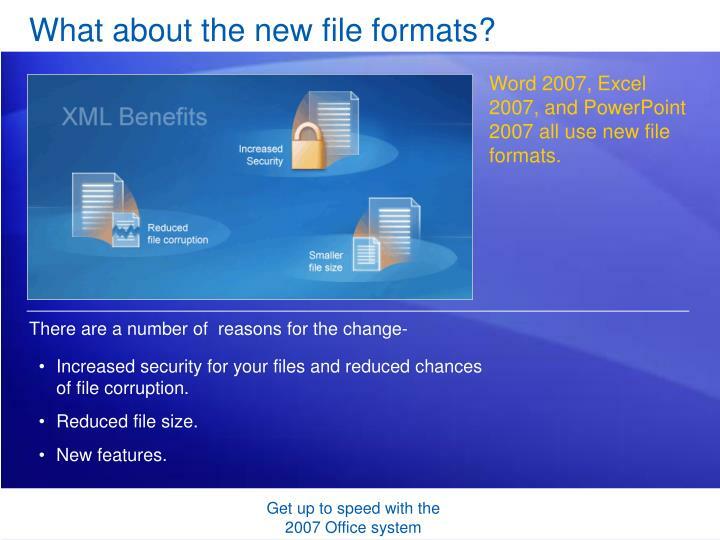 What about the new file formats? 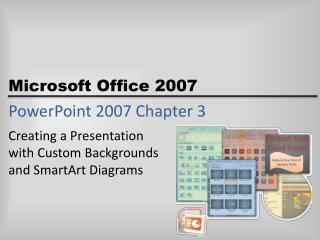 Word 2007, Excel 2007, and PowerPoint 2007 all use new file formats. Increased security for your files and reduced chances of file corruption. For documents, workbooks, and presentations, the default file format now has an “x” on the end, representing the XML format. 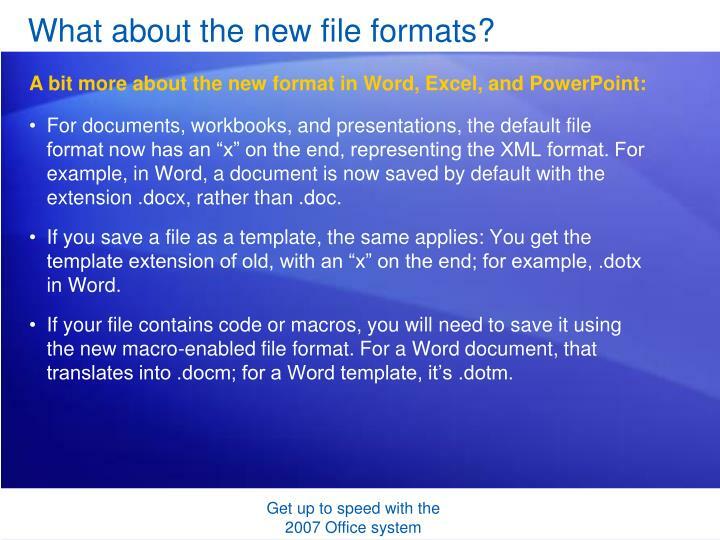 For example, in Word, a document is now saved by default with the extension .docx, rather than .doc. If you save a file as a template, the same applies: You get the template extension of old, with an “x” on the end; for example, .dotx in Word. If your file contains code or macros, you will need to save it using the new macro-enabled file format. For a Word document, that translates into .docm; for a Word template, it’s .dotm. 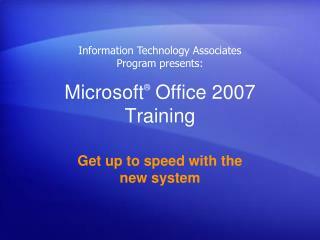 After working with it in the 2007 version, save the file. By default, the Save As dialog box saves a file created in a previous version as that same version. As you save, a Compatibility Checker will let you know of any new features added to the file that may be disabled, or matched as closely as possible. 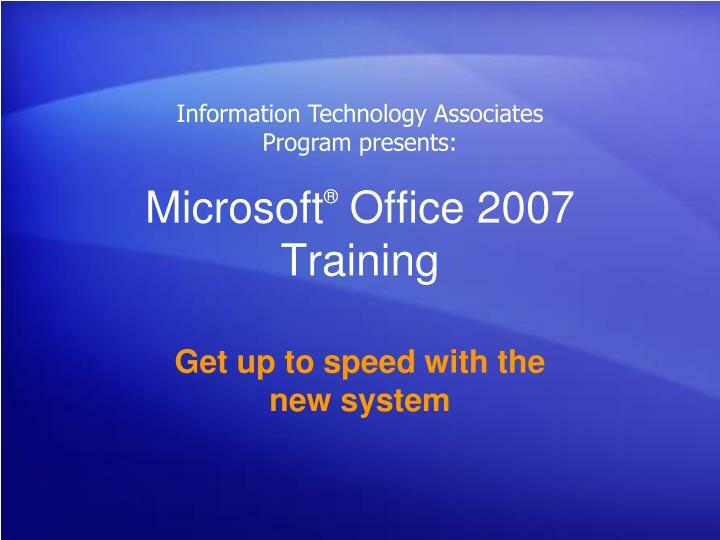 You can still share documents between the 2007 Office system and earlier versions of Office programs. 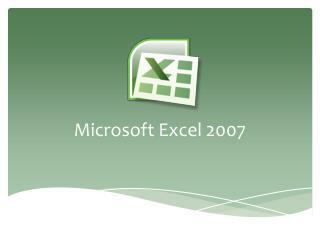 Colleagues who have Word, Excel, or PowerPoint versions 2000 through 2003 (and the latest patches and service packs) can open 2007 files. 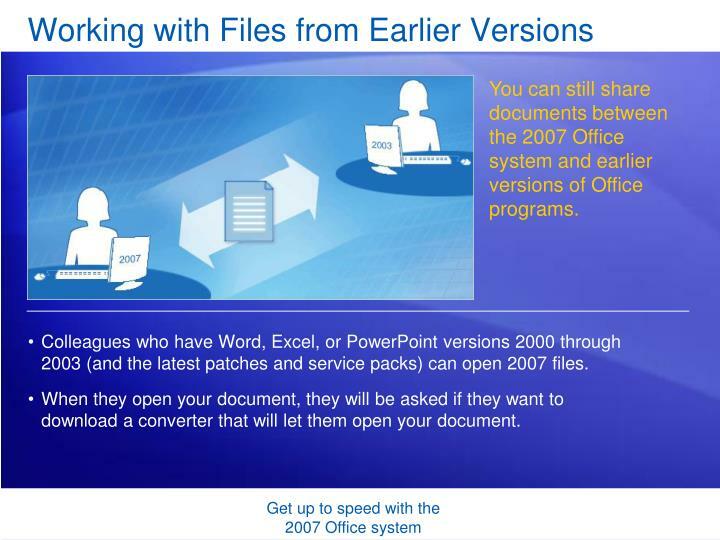 When they open your document, they will be asked if they want to download a converter that will let them open your document. What about the new file format in Access? 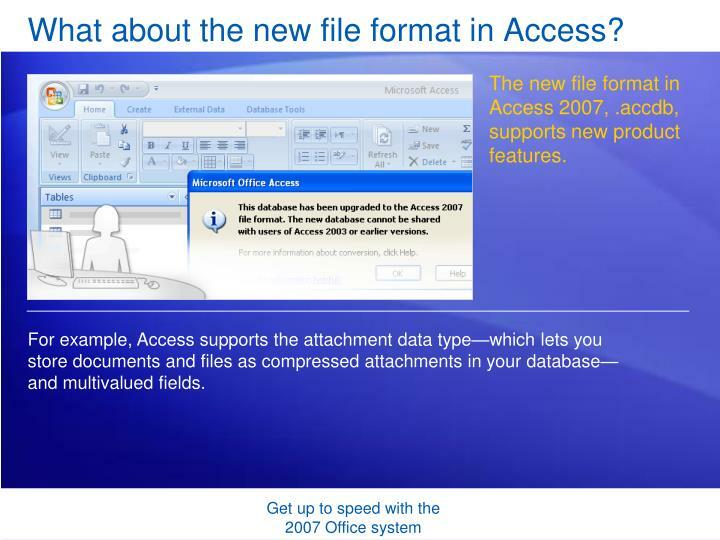 The new file format in Access 2007, .accdb, supports new product features. For example, Access supports the attachment data type—which lets you store documents and files as compressed attachments in your database—and multivalued fields. 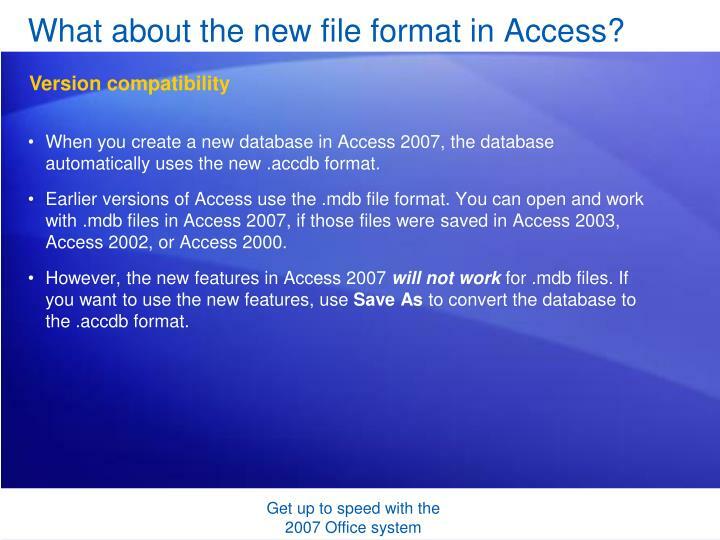 When you create a new database in Access 2007, the database automatically uses the new .accdb format. 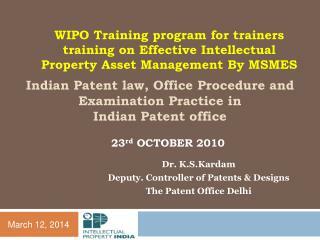 Earlier versions of Access use the .mdb file format. 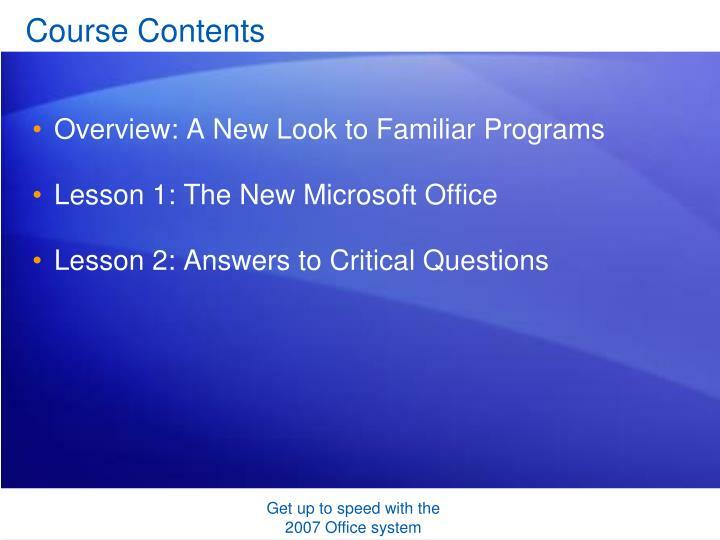 You can open and work with .mdb files in Access 2007, if those files were saved in Access 2003, Access 2002, or Access 2000. 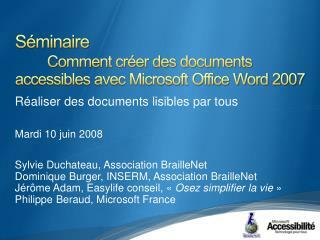 However, the new features in Access 2007 will not work for .mdb files. If you want to use the new features, use Save As to convert the database to the .accdb format. When you use Access 2007 to open a database saved in Access 95 or Access 97, Access 2007 offers to upgrade it to the .accdb format. If you do not plan to use the database with earlier versions of Access (and you do not use replication or user level security), you should upgrade the database. Important: You cannot open a database in .accdb file format with any version of Access but Access 2007. 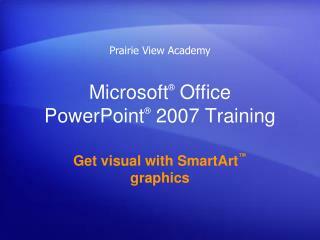 Microsoft Office 2003 -. 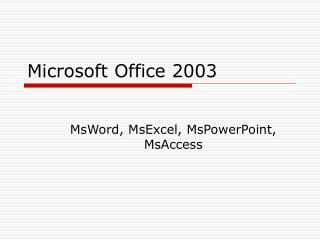 msword, msexcel, mspowerpoint, msaccess. 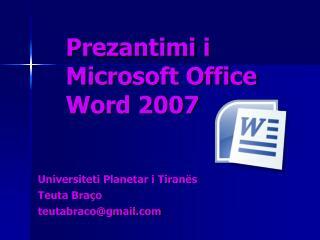 microsoft word. bekerja dengan dokumen. membuat dokumen baru file &gt; new&gt; blank document klik icon new membuka dokumen file &gt; open k lik icon open. 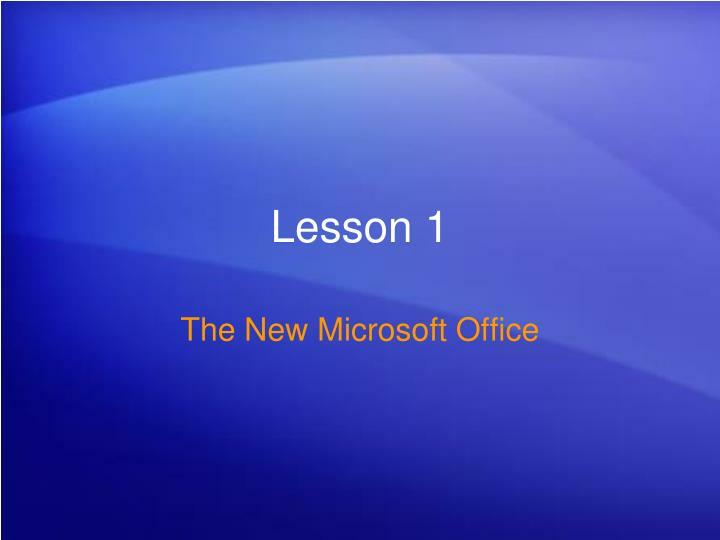 Microsoft 101 Training for Large Account Resellers -. 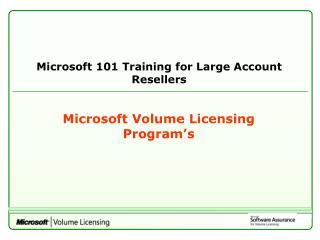 microsoft volume licensing program’s. agenda. 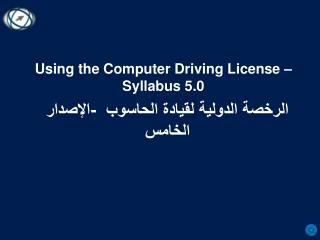 software assurance and benefits open programs select agreements enterprise agreements academic programs. microsoft software assurance.